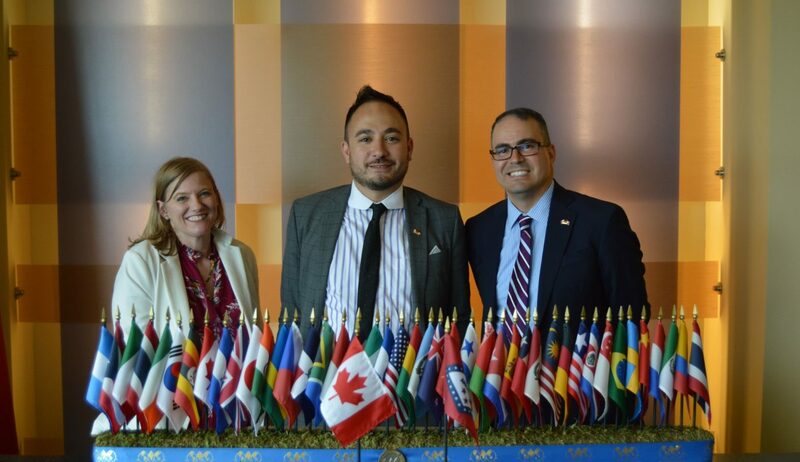 Foreign Policy and Diplomatic Service Officer Amy Goudar (left) and Consul and Trade Commissioner Delon Chan (center) from the Canadian Consulate General in Dallas stand with Melvin Torres (right) at the World Trade Center Arkansas. Foreign Policy and Diplomatic Service Officer Amy Goudar and Consul and Trade Commissioner Delon Chan from the Canadian Consulate met with stakeholders at Arkansas companies that included J.B. Hunt Transport, Tyson Foods and farmers like Golden Ridge Rice. “Arkansas is important to Canada and vice-versa because we’re your largest trading partner and best customer,” Chan said. Delon Chan (center) discusses export opportunities and strategies with Melvin Torres (left) and Kevin Wilikison (right) of Golden Ridge Rice Mills LLC of Wynne, Arkansas. These meetings were arranged for Chan and Goudar by Melvin Torres, Director of Western Hemisphere Trade for the World Trade Center Arkansas. Torres also arranged visits with Arkansas Secretary of State Mark Martin, and representatives from the offices of Congressman Steve Womack and Senator John Boozman. “We really appreciate all the excellent work and support from the World Trade Center to build the relationship between Arkansas and Canada,” Chan said. “We want to continue to build upon the work that the Center is doing to promote trade between our countries,” Chan said. The Canadian Consulate General in Dallas serves as its diplomatic mission for the states of Arkansas, Louisiana, Oklahoma, Texas and New Mexico. The World Trade Center Arkansas has worked hand in hand with the Consulate multiple times before. Chan represented Canada in trade and diplomacy meetings held around the World Trade Center Arkansas’s ten year anniversary. Chan said the importance of their trip to Arkansas centered on the opportunity to engage with companies and other interested stakeholders and discuss the importance of the Arkansas-Canada relationship. Overall, Canada is Arkansas’s largest export market exporting $1.3 billion in goods and $182 million in services annually. In addition to this, Canadian visitors to Arkansas spend $7 million every year.